The Triumph | The battle has begun. Which side are you on? 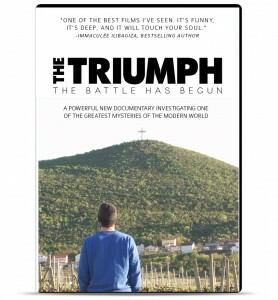 The Triumph is a powerful documentary film about a prophecy unfolding right now, before our very eyes: Medjugorje. From a tiny village in Bosnia-Herzegovina comes a warning to the world, and a message of hope. Does this woman really know mankind’s future, as millions believe? Decide for yourself. NOW ON DVD! Learn more.